Here are some before-and-after examples of Sarah’s work! Only purchase was two new blue towels, everything else was client owned. 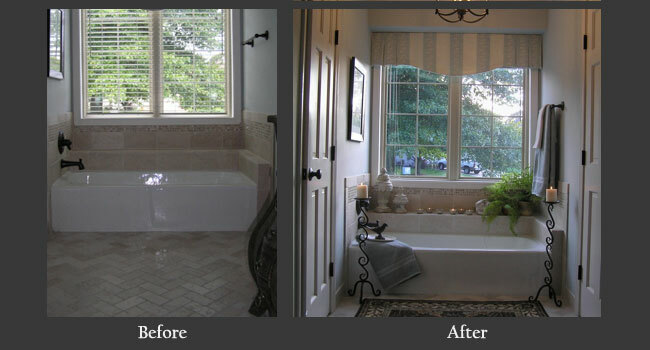 With this very common tub, using the tall floor candlestick holders helps add importance to the tub area. Also the small platter atop the folded towel on tub ledge also takes away from the simple tub. This porch is long and narrow--proper scale and placement of furniture is key in this space. Opened out doors on hutch, bought wall brackets and flower stems. All other items were found in the home and creatively used to fill in the hutch wall. Amazing what dressing the table top does to otherwise bland table top! Shop your home! Used existing white comforter as filler for purchased duvet and pillow shams. Shopped in client's home for everything else. As a guest room, the tray on the bed adds a nice inviting touch.